North Central Railway Recruitment notification published for the engagement of Apprentice. Candidates who are willing to be admitted for Apprenticeship can check this details and apply online by fulfilling it's eligibility criteria and condition. Some essential and important information related to this North Central Railway Notice is providing in short. Candidates who want to participate in this NCR Act. Apprentice vacancy, the participant should be qualified minimum 10th standard or equivalent under the 10+2 education system. 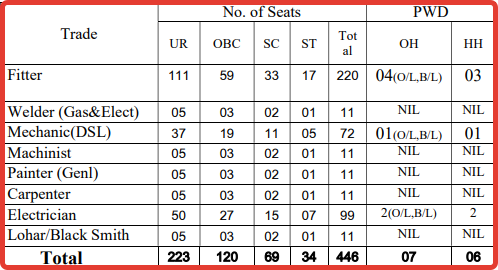 Also, candidates should have passed ITI certificate passed in the relevant trades. As you can see the vacancy list and trades on the above photo. Age Limit: The age limit for this NCR rAct Apprentice, is between 15 to 24 years as on 17th December 2018. The upper age shall be relaxable for the candidates of reserved categories. See the official notification for brief information. Application Charges: RS 100 only have to pay online to participate. Though candidates who belong to SC/ST/PH or any women are exempted to pay any charges. Last Date to apply: The last date for the final submission of online application form is 17th December 2018. Official notification: Below we have provided the official notification and apply links for this NCR Act Apprentice vacancy. Before applying to this North Central railway recruitment, please check official notification carefully and decide whether you have to apply or not. 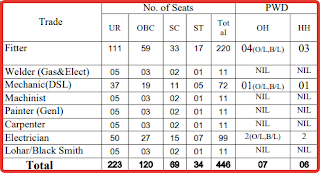 ►Do you need Sarkari Naukri Result? Then you may check the following vacancy details. We have discussed before this NCR Recruitment details.